where you'll find solutions and answers to your most pressing home decor color issues and challenges as you face settling yourself and your family into your new home and surroundings. 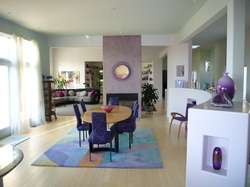 Specializing in color consultation, Second Stage Interiors works hard to meet our clients' own unique needs. Our focus is always to help you to maximize the ambiance and functionality of your own home in the most cost effective and efficient manner. - Architectural color consulting: We can easily help you choose a color palette that will pull your own home and belongings together into a harmonious unit. Find out more here. Also, enter our monthly drawing to receive a free home color consultation here. Fitting your existing furniture into a new home can be a frustrating experience. Even if you have help in doing all the physical work of moving out of a home, the experience of packing and unpacking is seldom anything but draining. The drive to quickly settle into your new home is typically great and often overwhelming. Where do you put everything so that you feel at home again? How do you decide where to put your favorite things? What should your priorities be in getting yourself and your family settled again? Everyone's situation is unique and so will their priorities be in settling into a new home. Sometimes the house has been painted before it's gone on the market so whole house painting isn't necessary but you might want some color added to certain walls. Or sometimes the paint on the walls just isn't to your taste and you're looking to do a complete color transformation to your new home. So, sometimes painting your walls to coordinate with your current belongings is your first priority. In my experience, it's rare for me to walk into a new consultation where the owners haven't already placed the majority of their furniture. Most of us have a good sense of traffic flow throughout rooms and can easily see where our largest pieces of furniture need to go. But also it's typical that folks just aren't happy with the overall "feel" of the rooms after they've placed that furniture. What's the reason for that? It's all in the details. The details of any room and the attention to those things are often the difference between a home you're happy with and one you're not. It's also not uncommon for my services to involve little more that "tweaking" a room or rooms. Please see "Small Changes/Big Impact" on this website for a few of the simple changes that I've implemented that have completely transformed some rooms.